Spending time with your customers and staff is an excellent way to forge lasting, mutually beneficial relationships. 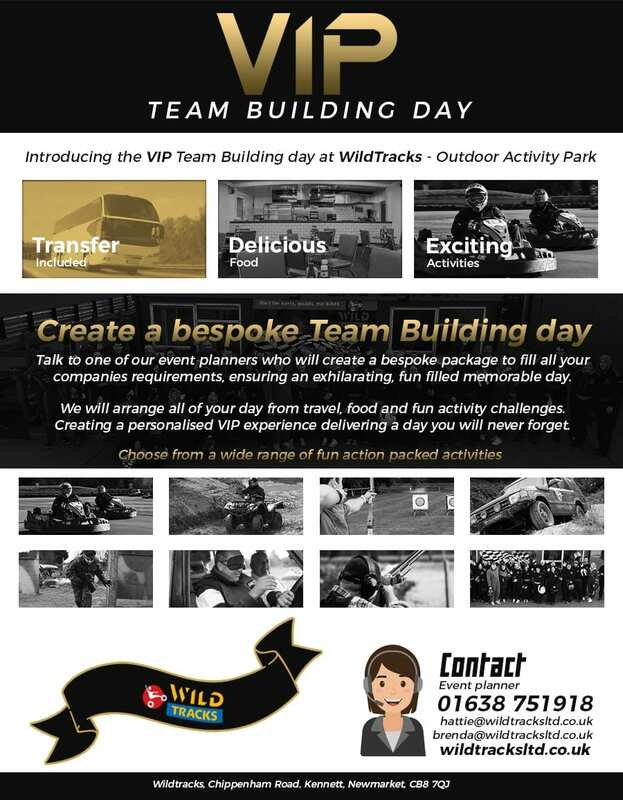 WildTracks is a diverse and exciting venue offering a variety of packages to suit your needs; be they to motivate, entertain, thank or address a specific challenge facing your organisation. The 60 acre park has dedicated off-road 4×4 courses and custom built tracks and circuits for motor bikes, karts and quad bikes. Additionally clay pigeon shooting, archery, cross bows and laser guns are available. Our facilities include reception area, conference rooms, cheerful café, first aid centre, power washes, children’s playground and lots of parking. We also have an attractive lakeside picnic area and offer on site camping. We also have informal, inexpensive on site meeting rooms available to hire from £35 per day and can provide a range of catering options including barbeques, buffets and hog roasts. Bring your employees and/or customers to WildTracks just for fun! Our corporate packages start from £98 + VAT per person and we will work with you to build your event. Please contact us on 01638 751 918 or email us. We are proud of our association with a number of prestigious local venues offering conference facilities and accommodation. The British Racing School is minutes from WildTracks and offers a range of conference rooms and affordable accommodation. Set in over 100 acres of parkland on the banks of the River Cam, the Wellcome Trust Conference Centre comprises a purpose-built conference centre and a Grade II* listed country house, Hinxton Hall. “On behalf of colleagues at Botswana Investment and Trade Centre (BITC) we would like to extend our deepest gratitude to you and your team for a tremendous day out (13/9/14) at WildTracks. All your colleagues from start to finish were friendly, efficient, engaging and encouraging in all the activities we were booked for.